In the midst of Breast Cancer Awareness month, many corporations are making an effort to do their part in raising awareness for the cause. But lesser-known entities as well have been making remarkable strides for individuals that are truly in need of some hope. Checkmate, Cancer!, a campaign begun just eight months ago, aims to raise money for young cancer patients in the hopes of given them a second chance. The Checkmate, Cancer! campaign, started by 20-year-old New York cancer survivor Elona Karafin, was initially proposed as a fundraiser where she and her team would participate in the annual Pediatric Cancer Walkathon. However, the campaign quickly gained recognition that exceeded far beyond its expectations. Karafin, a student at CUNY’s Baruch College, surpassed her fundraising goal by 250 percent in just over two months. She and her team quickly realized that Checkmate, Cancer! could truly make a difference in the lives of individuals suffering from cancer. Way back in March, we told you about Elona Karafin, then a 19-year-old Bensonhurst native and cancer survivor who kicked off “Checkmate, Cancer!”, an initiative to fund research for pediatric cancer. Karafin, who was diagnosed with Ewing’s sarcoma, a bone cancer, at age 10, helped raise thousands of dollars for the Pediatric Cancer Foundation with Checkmate, Cancer! Now the group is turning to aid 20-year-old Nancy Parmar, a Brooklyn College student recently diagnosed with acute myeloid leukemia. Parmar was diagnosed after visiting a doctor for what she believed to be a cold, and was admitted to Memorial Sloan Kettering Hospital in July. While her insurance company is covering the regime of experimental drugs to keep the cancer at bay, it won’t cover the life-saving bone marrow transplant that could cost as much as $60,000. Childhood cancer is the number one cause of non-accidental deaths among children, with 12,000 diagnoses each year. 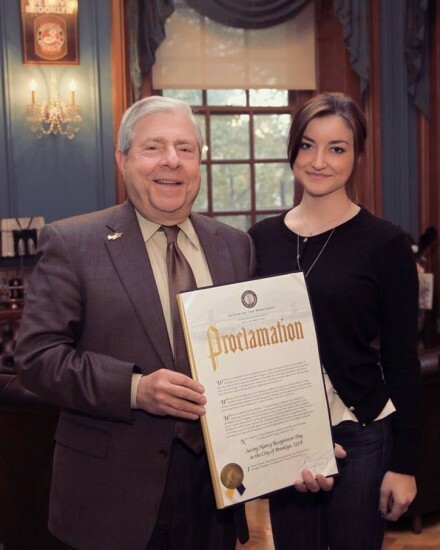 Elona Karafin, a 19-year-old Bensonhurst native, has started ”Checkmate, Cancer!”, a team participating in the annual Pediatric Cancer Foundation (PCF) walkathon, in the hopes of ending this deadly disease. When Karafin was 10 years old, she was diagnosed with Ewing’s sarcoma, a type of bone cancer. For two years, she suffered through chemotherapy and countless surgeries, but she refused to let the disease win. Since then she has been involved with various charities to help the cause. “As a cancer survivor, I want to dedicate a portion of my life giving back to the people and institutions that save children’s lives every day,” said Karafin.